Dr. Laura A Frigyes, MD is a Doctor primarily located in Elkhorn, NE. She has 26 years of experience. Her specialties include Internal Medicine. She speaks English. Dr. Frigyes has received 5 awards. The overall average patient rating of Dr. Laura A Frigyes is Good. Dr. Laura A Frigyes has been rated by 29 patients. From those 29 patients 7 of those left a comment along with their rating. The overall rating for Dr. Laura A Frigyes is 3.3 of 5.0 stars. She took the time to listen to my concerns. I did not feel rushed. I miss the doctor I had for years, her name was Dr. McKleese. She left Methodist Health System for a private practice (boy did they lose a talent in her).she was respectful, mindful of my needs, and worked really hard for me and my health. I feel that Dr. Frigyes has room for improvement, she needs to remember the patients she is scheduled to see, she needs to take time to get to know them, try to remember accounts from prior visits, etc. She seems a bit dis-interested, I have seen her now 3 x. I am going to give it a little bit more time, but I really need to see some improvement in her willingness to listen and help. Doesn't spend much time with you. Eager to prescribe meds. Dr Frigyes was very unfriendly, acted as though I was bothering her by being there. She did not discuss any concerns I had nor even look at the medical records and med list I had given her. She typed a little bit in the computer, gave me totally different prescriptions than I had been and that was it. There were no follow ups scheduled or phone calls from her regarding anything. My search is on for a great doctor who listens and cares about their patients in West Omaha. This doctor was very unfriendly. She dismissed every health concern that I had. I was very sick when I went to see her, and she proclaimed that I "looked healthy" but I felt terrible. Eventually, I had to return to a wonderful doctor (highly respected) who is very hard to get in to see, which required a long wait. I had 3 very serious diagnoses, any of which could have caused major problems. Dr Frigyes just did not care about me. I felt like I was bothering her. She spoke to me from the doorway and never even entered the actual room. When one is as sick as I was, that behavior was very discouraging to me and just made me feel worse. Take a minute to learn about Dr. Laura A Frigyes, MD - Internal Medicine in Elkhorn, NE, in this video. Dr. Laura A Frigyes is similar to the following 4 Doctors near Elkhorn, NE. 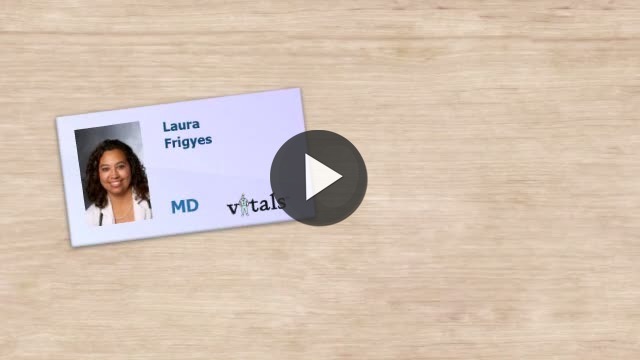 Have you had a recent visit with Dr. Laura A Frigyes? Select a star to let us know how it was.